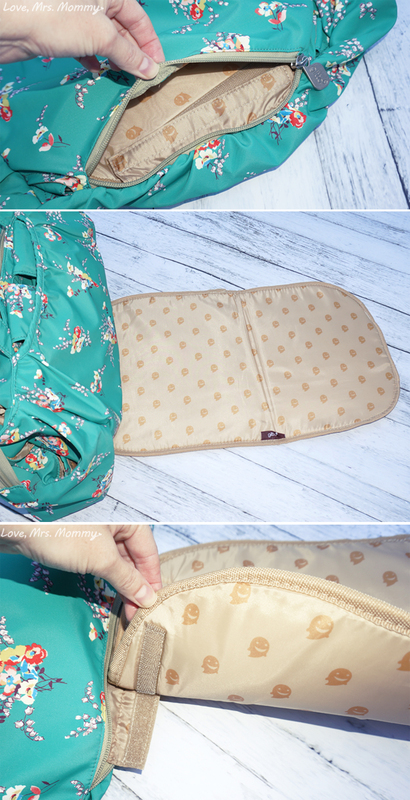 Love, Mrs. Mommy: Gitta Trend Makes For A Discreet & Stylish Diaper Bag! Gitta Trend Makes For A Discreet & Stylish Diaper Bag! I received a Gitta Trend at no cost to facilitate this review. All opinions are my own. This post contains affiliate links. Before I had a baby I thought to myself… I am never going to carry a diaper bag. I had so many cute regular bags, why would I want to swap them out for a boring diaper bag. But then my daughter arrived, and the need for a diaper bag was inevitable. My regular bags just weren’t cut out to store diapers, wipes, bottles, the changing pad and everything else a baby needs. That’s why I am super excited to partner with Gittabags, because I believe they have just what us parents are looking for... cute, stylish bags with discreet functionality. So much in fact that you might not ever go back to your old handbag again, even after baby! 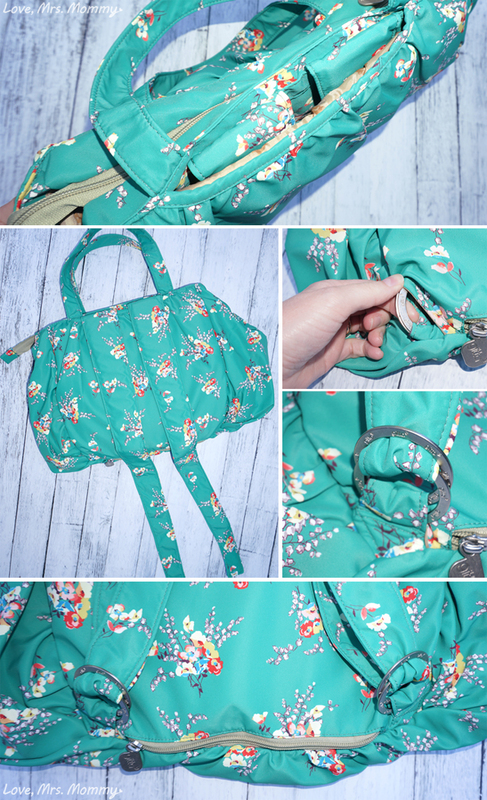 I received the beautiful Gitta Trend in Printed Green to review and I couldn’t be more impressed! I have nicknamed this bag the James Bond of Diaper Bags. This bag looks like a regular, cute and stylish bag that any woman would want to carry, but it’s also a diaper bag! Woah! Upon first inspection you notice the obvious… the lovely print on the durable waterproof material, as well as the easy to carry shoulder straps. Once you look further, you realize that on both sides of the bag there are bottle holders with a nice elastic bands to keep them in place. 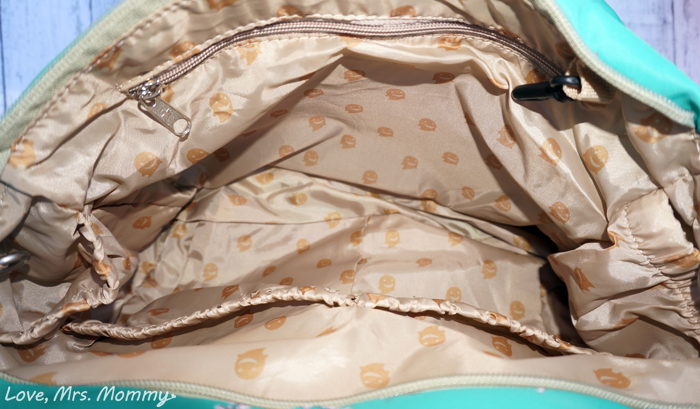 When you open the zipper at the top of the bag, you open up a world of storage. On one side you will find a long zipper compartment, which could fit a large wallet and other personal items. When you receive the bag you will find a mesh laundry bag and GittaGrips in this location. GittaGrips are perfect for attaching the bag to a stroller or other items such as grocery or shopping bags. On the other side of the bag you will find two deep, flat elastic pockets which are perfect for holding diapers and wipes. 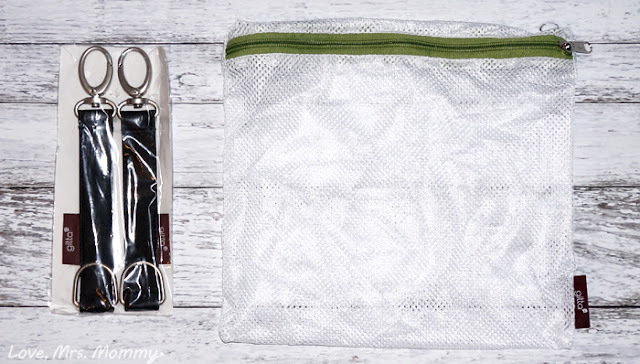 On both the left and right side of the bag you will also find elastic pockets helpful for storing your cell phone, small bottle and/or other items. There are also two rings and a clip inside the bag which make finding your keys a breeze and having a pacifier in a handy spot. The bag is extremely flexible, accommodating, and lightweight. Need to be hands-free? No problem! I told you this was the James Bond of Diaper Bags, right?! Well, check this out! There are two hidden padded straps that will turn this into a backpack style bag. You can see them at the opening next to the handles at the top of the bag. Once they are pulled out, you will need to loop them through the rings, which are also hidden at the bottom of the bag. I love the fact that you can adjust the straps perfectly to your needs. When you want to go back to carrying it like a regular bag, un-loop the straps and tuck everything back into their secret compartments. Looking for more James Bond features? I have another for you! When you are out and about with baby there is bound to be a diaper change here and there. The Gitta Trend has you covered. At the bottom of the bag there is another zipper compartment. Just unzip and fold out the diaper changing pad! It’s liquid-repellent which, of course, is uber important for a diaper changer! I love my Gitta Trend! It’s so cute and I love how light it is! I can carry everything I need in this bag with room to spare, which is something I haven’t said… like ever! I appreciate the hands-free design option and the discreetness of the bag. When I carry this bag I feel like no one knows it’s really a diaper bag, and I love that! Connect: Find out more about Gitta by visiting their website. Then make sure you “like” them on Facebook and follow them on Instagram. Buy It: You can purchase the Gitta Trend featured in this review here, or browse/shop all their many styles of bags here, or on their website. LOVE it!! I love that it can be worn as a backpack or a shoulder bag!! So cute!! Also, that print is AMAZING!! This diaper bag is so cute! Thank you for the review. I love this. It's so awesome how it doubles as a backpack! Those are very cute bags. Gitta Trend makes a discreet and stylish Diaper Bag! I cannot say it any better!! I like that you can carry it as a duffel bag or use it as a backpack. These are great!! So unique, love the different ways to carry this! These are so versatile and different. I really like that you can use them different ways. What a cool item! Love the pattern. Wow! This is really a super duper Diaper Bag. I didnt realize how big it is . It has room for everything plus more! Lol! 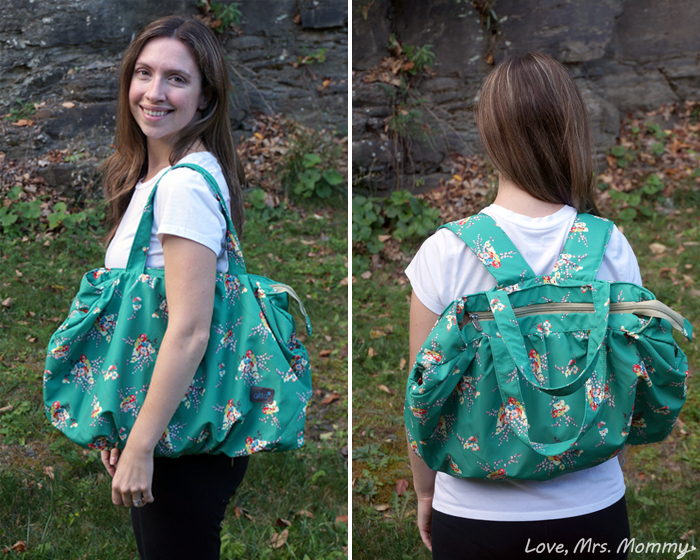 I love the green print on your Diaper Bag! Being able to turn it into a Back Pack Is great!Store Bottles on Both sides of the Bag. This one is Loaded. Thankyou for this wonderful review! That is so stinkin' cute! I need this in my life! I like the idea of using this in more than one way. Thank you for sharing! Love the look of these bags! 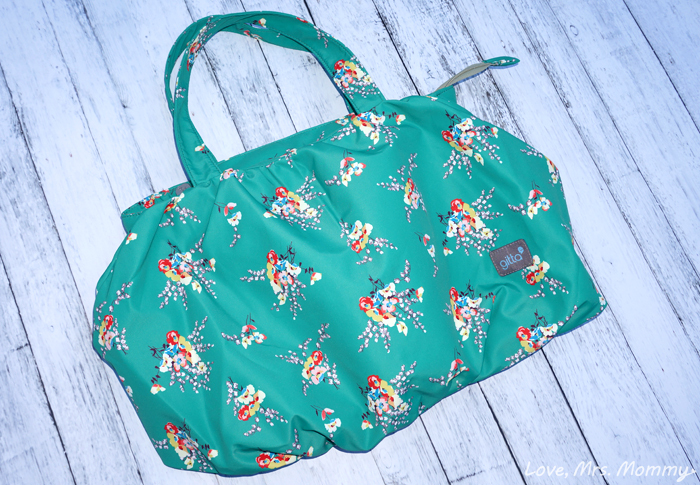 It is so versatile, doesn't look like a normal diaper bag at all! totally stylish! These are great. So unique and versatile. This looks so pretty and stylish and would make a great gift for my daughter who is expecting. This looks like what might make that of the perfect bag when my relative spends overnight in the hospital!